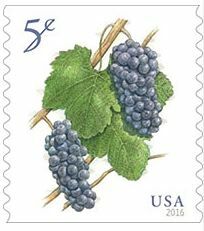 USPS Announces Pinot Noir Stamp The United States Postal Service released a 5 cent business stamp on February 19, 2016, that depicts a cluster of Pinot Noir stamps based on original pen and ink and watercolor by Art Director Derry Noyes. Unfortunately, you cannot mail a letter with the stamp and it is currently only available in rolls of 10,000 for $500. I suspect this may be the first of a series of stamps depicting wine grapes. As an added note, the decision of the USPS to allow shipping of alcohol is still under review. Visit www.usps.com. Family Winemakers Tasting Family Winemakers of California will host its sixth tasting of family produced California wines on March 20, 2016, at Wyland Center at the Del Mar Fairgrounds in San Diego. This is a one day event and the opportunity to taste over 500 wines offered by over 125 wineries from 60 of California’s appellations. Consumer tickets are available for $75 at www.16SDconsumer.eventbrite.com. 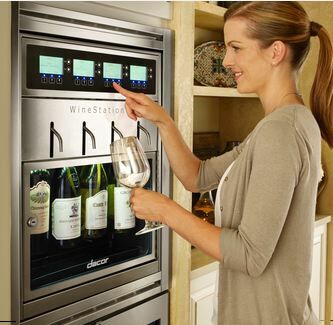 Dacor Winestation Dacor now sells the first automated, temperature-controlled, four-bottle wine dispensing and preservation system for the home that is appropriate for the kitchen, den or wine cellar. The unit, named Discovery™ WineStation, maintains the freshness of your favorite wine for up to 60 days without the loss of flavor or natural aroma. Visit www.dacor.com/Our-Products/Refrigeration/Discovery- WineStation.aspx. Direct Air Service Launched Direct nonstop flights on Horizon Air (Alaska Airlines) will start March 16, 2016, between Orange County and Santa Rosa. This is a godsend for those in Southern California who like to visit the wineries of Russian River Valley. School House Releases 2012 Pinot Noir School House Vineyard is a fascinating cult producer of Pinot Noir, Chardonnay, Syrah Blend and Zinfandel Blend that is rich in Napa Valley history. The vineyard is located high up Spring Mountain at the intersection of Spring Mountain Road and Langtry Road at 1,500 feet elevation. The vineyard takes its name from the one-room school house once located here daring to 1889, but destroyed by fire in the mid 1980s. In 1940, John Gantner’s father bought the 160-acre property which had 35 acres of non-irrigated vines. There were a few operating vineyards in the area at the time, but during Prohibition many families moved away and abandoned their vineyards and fruit orchards. Today, the second generation of John Gantner and Nancy Walker do all the vineyard operations where they make their home. Each of the School House wines are vinified in the caves at neighboring Pride Mountain Vineyards. The first vintage of School House Pinot Noir was 1957, made from grapes that had been planted in 1953. The original Pinot Noir budwood was brought from Domaine de la Romanee-Conti by John Daniel of the Inglenook Estate and he gave the cuttings from his plantings to John Gantner’s father. 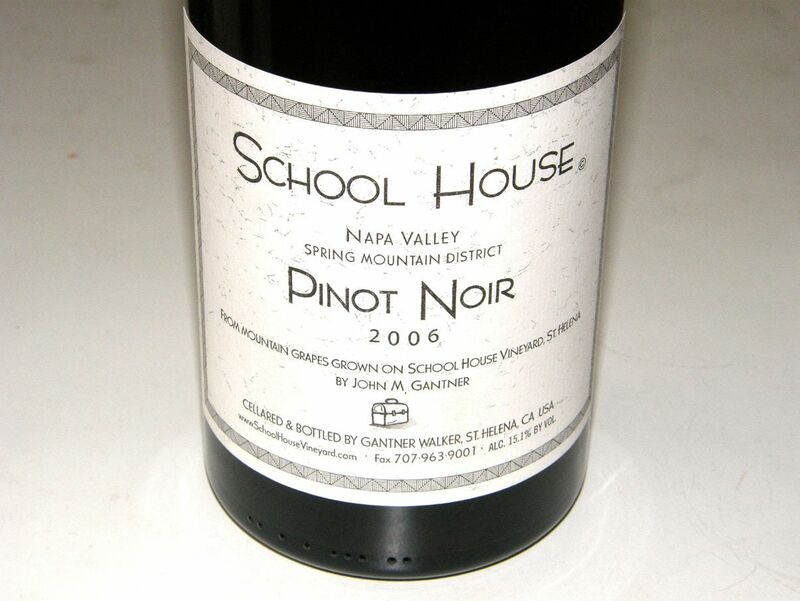 The 2012 School House Napa Valley Pinot Noir, 19 barrels, is available for $85, by phoning 707-963-9001 or emailing Nancy at Nancy@SchoolHouseVineyard.com. Visitors are welcomed by the gracious proprietors by appointment and I would urge you to take in the history and magnificent wines from this historic estate. I wrote an extensive article on School House Vineyard after I visited in 2012: www.princeofpinot.com/article/1202/. 2016 Outstanding in the Field Tour Dates Announced Tickets go on sale Sunday, March 20 for the national tour with dinners beginning in California. Visit www.outstandinginthefield.com for the schedule. Soliste Release First Pinot Noir from 2013 Vintage Claude Koeberle and Donald Plumley announce that they have released the EXTRAVAGANT Sonoma Coast Pinot Noir. Like all Soliste Pinot Noirs. the partners are obsessive and only select the very best grapes through multiple passes at harvest and use whole cluster fermentation (in this wine, 50%). The wine was aged for 16 months in a single 225-liter French oak barrel selected from Tonnellerie Rousseau. The EXTRAVAGANT is the one barrel, 23 cases, that stood out among all the best. In Burgundy, a winemaker may reserve a special barrel for friends and family. They call this barrel Soliste. Very limited allocation at $100. Visit www.soliste.com to join the allocation list. Another Grapevine Virus to Worry About www.winesandvines.com reported that the grapevine Pinot Gris virus (GPGV) has recently been discovered in several Napa Valley vineyards after having been previously found in many vineyards internationally. The virus has been discovered not only in Pinot Gris, but also Pinot Noir and Chardonnay. A member of the Trichovirus genus, GPGV is believed to be spread by a mite. The effects of the virus on grapevines and wine quality is poorly characterized at present. FPS has begun testing all imported and local selections for this virus. It has not been found at the Classic Foundation Vineyard.